When you glance at someone’s profile on a dating site you’d expect to read about their favourite films.. but not to find out that they are 24 metres away from you. Well, wake up and smell the after-work cocktails, because as of next week you’ll be able to. I had a sneak preview today of an iPhone app that does just that. It’s linked into location-based dating site LoveStruck and founder Brett Harding came in and showed it to us. The dating site specialises in hooking up single professionals who work near to each other – with the intention of making dates more convenient. It also provides a “filter” or barrier to entry in that members have to have a job. The site will also filters results for you according to what you’re looking for: men 25+ for example. I’m sure you don’t need me to tell you that mobile phones are a natural place for online dating – don’t need to have it open on your work computer, it’s that bit smaller and more private. And building location in is an interesting idea. Location is The Next Big Thing for mobile apps and while “nearby” apps telling you where the post office is are very useful – we’re still waiting for apps to come up with innovative ideas for it. And this Lovestruck app sure is innovative. When Cupid is tracking you with more than his arrow.. If you let it track your location, and set it to alert you, it will send you a push notification when someone you might like is within a 50m, 100m or 500m radius of where you are. If this all sounds a bit more Terminator 3 than romantic, you can switch that off and just use the app to browse the site as you would from a computer. In what is quite a complicated app, there are several layers of privacy: you can give your exact location, be only identified by your tube stop, or hide your location to all but people you have favourited. The defaults are all set to the most private settings so you won’t accidentally find yourself winking at your boss. 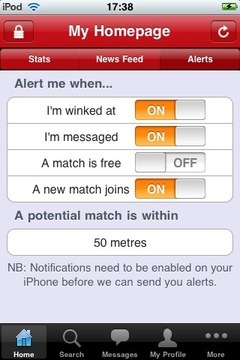 You can also set a status update letting people know that you’re available for lunch or after work drinks. Subscription to the full Lovestruck dating service is £24.95 a month, the same as Match, Meetic, Guardian Soul Mates and the Telegraph’s Kindred Spirits. You can register for free and the site lets you look, wink and reply to messages on the free model. The app is free to anyone who has subscribed.